By all rights, Walcott-area native Sunshine Woolison Ramsey and her sultry singing voice should be cranking out CDs somewhere, perhaps in a Nashville recording studio. But Nashville’s loss is the Quad-Cities’ gain. We get to hear Ramsey perform regularly with her fellow Bootleggers — the singing and dancing waiters and waitresses — in pre-shows at Circa ’21 Dinner Theater. And we’ll soon be treated to her one-woman music show on the Circa stage. “A Night of Sunshine” is Ramsey’s own cabaret show, and it takes place Thursday, Sept. 23. Doors open at 6, and the show starts at 7. Tickets are $10 in advance or $12 the day of the show. Phone (309) 786-7733, extension 2, for more information. Ramsey has been a Circa Bootlegger for eight years. Circa ’21 producer Denny Hitchcock must recognize talent when he sees it. Ramsey says her cabaret show was his idea. The show, which will have two acts, 45- and 30-minutes, respectively, features a variety of music. Ramsey will be accompanied by a seven-piece band. And if you’re a regular customer at Circa, she says you’ll recognize its musicians. Ramsey says the band members are Circa Bootleggers and actors. “Pretty much everyone in my band has been on the Circa stage,” she says. Thanks to a karaoke contest, some aspiring young singers also will be on the Circa stage Sept. 23, doing solo performances during “A Night of Sunshine.” Circa’s Speakeasy is hosting a kids’ karaoke contest on Aug. 14, 21 and 22. There are two age categories, 8-12 and 13-17. In addition to performing during the cabaret show, the winners will receive $50 and a trophy. Details and a song list are available at circa21.com. There is a $10 registration fee, and all contestants must register in advance. As for Sunshine Woolison Ramsey, if you look up the word “busy” in the dictionary, you just might see her picture. If addition to her demanding Bootlegger job and preparing for the cabaret show, Ramsey and her husband, Jeff, have a 3-year-old son, Carter. She also operates a Rock Island dance studio, Sunshine’s Performing Arts Studio. How does Ramsey get all her work done every day? “I don’t know,” she says matter-of-factly. “Super woman,” she adds with a laugh. Copyright 2010, by Phil Roberts, Creative Enterprises. This piece ran as a column in “The North Scott Press,” Eldridge, Iowa. 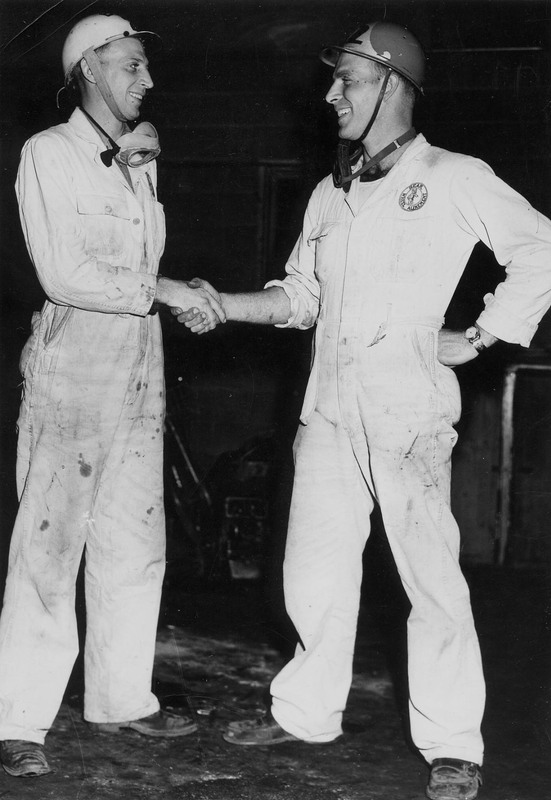 Bud, left, and Gene Benner congratulate each other following a race. Photo courtesy of Georgia Hoggatt. Bud, left, and Gene Benner stand next to their cars in front of the Benner Brothers’ Garage. Photo courtesy of Georgia Hoggatt. 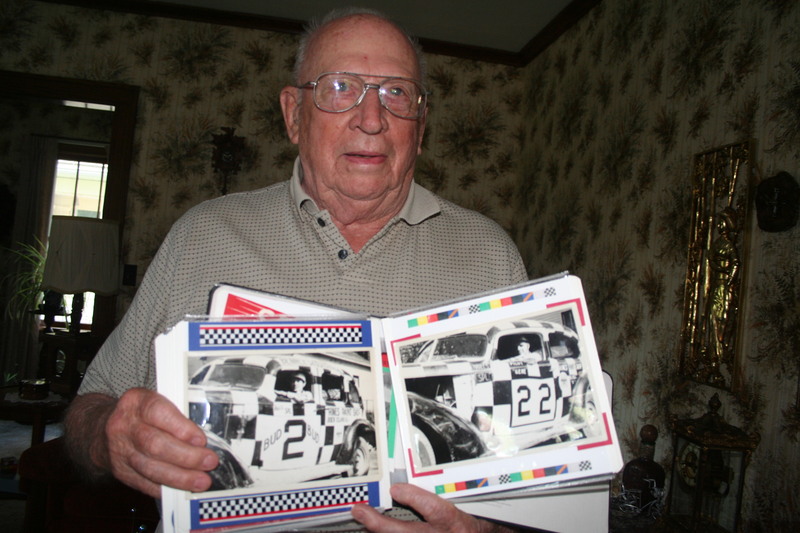 Bud Benner, pictured in his Rock Island, Ill., home, holds a scrapbook with pictures of the brothers' race cars. Phil Roberts photo. 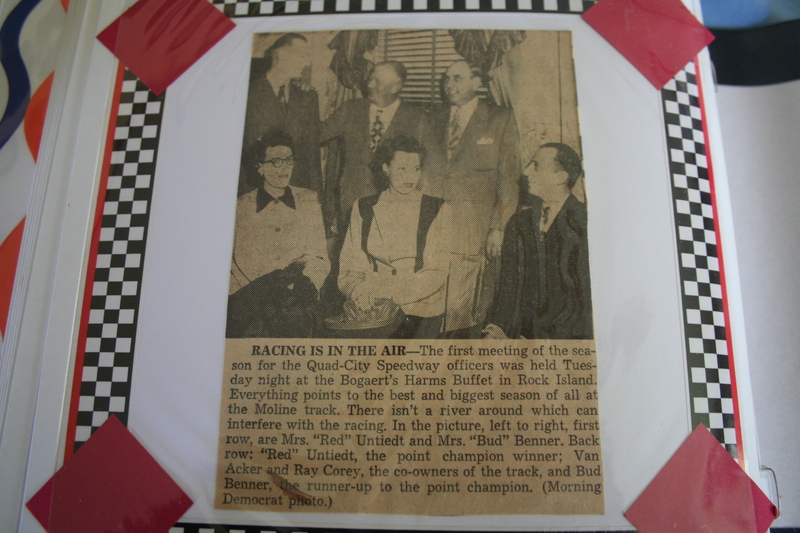 One of Benner's clippings detailing his racing exploits. Phil Roberts photo. This photo and clipping deals with formation of the old Quad-City Speedway. Phil Roberts photo. Bud Benner, who will be 92 in October, is in good shape, perhaps in part because he is an avid golfer. Phil Roberts photo. He only raced eight years – one year in Midgets, then seven in Stock Cars. But he made a name for himself, and he has some great memories of his bullring battles. 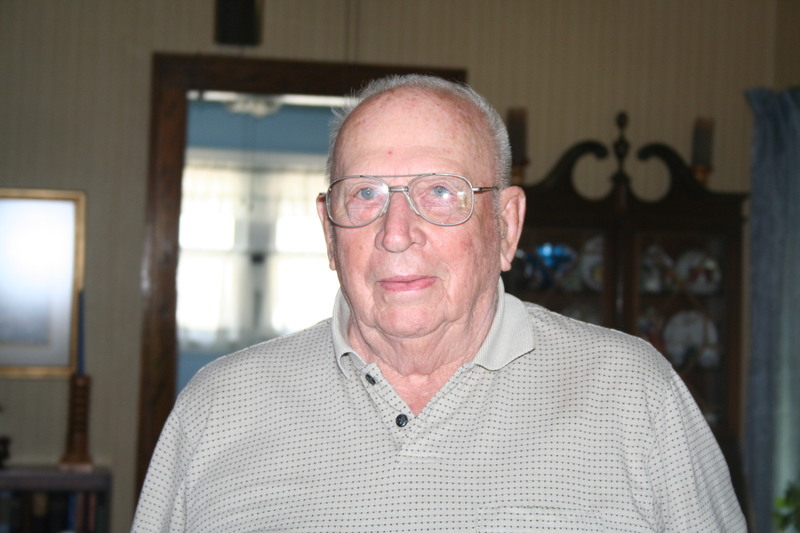 George “Bud” Benner, who will turn 92 in October, lives in Rock Island. A World War II veteran, Benner raced midgets in 1947 without a great deal of success. Then he switched to a growing new fad, Stock Car racing, in 1948. And he did well from that point on. His brother Gene also raced. Bud Benner’s stock car career began when he and a dozen other drivers formed the Devil Drivers Racing Association to compete at the newly opened Mahoney’s Variety Park track, which was located west of Davenport. Lake Canyada now sits above the old speedway. Benner paid $90 for first Stock Car, made from a passenger car his brother-in-law had wrecked. The car didn’t have a rollbar, but it did have a seatbelt, which was an old aircraft belt Benner had purchased at an Army surplus store. “The first race out, I made $90, so I paid for the car,” Benner recalls. Benner and his brother co-owned a garage in Rock Island and found someone to paint their cars in a black-and-white checkerboard design. Bud Benner raced No. 2; Gene was No. 22. 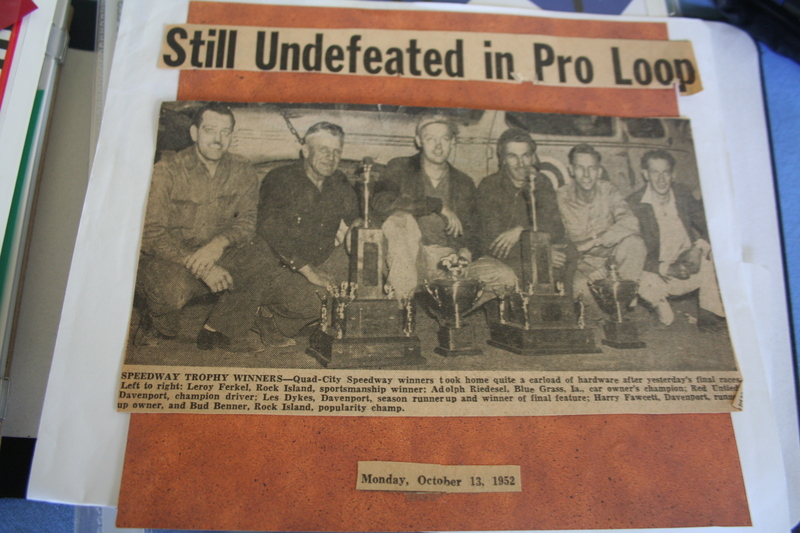 The year 1950 was a big one for the Benner brothers’ racing program. Quad-City Speedway in Coal Valley, Ill., opened in June of that year. Bud Benner loved the track, which eventually fell victim to Interstate 280, and was its first champion. The brothers were actually full-time racers in 1950. They raced at Mahoney’s on Sunday afternoons and CeMar Acres near Cedar Rapids, Iowa, on Sunday nights. The duo competed Tuesday nights in Waterloo, Iowa; Wednesday nights back at CeMar Acres; Thursday nights in Columbus Junction, Iowa; and Friday nights at Quad-City Speedway. They were off Saturdays, surprisingly, and Mondays. They worked on their cars those nights. But Bud Benner also had a life outside of racing. In fact, despite being engaged in tight points battles, he took several weeks off from racing each year to take his wife Nelda and their three daughters to Minnesota for lakeside vacations. “I like to fish,” he explains. The cars were strictly stock in Stock Car racing’s early years. “Back then you just raced the car the way it was,” Benner says. “You couldn’t add any racing gears or anything to it. If it was manufactured for that car, you could use it. Benner raced against the same drivers regularly and got to know their driving styles. One he could never beat, though, was Les Dykes. Benner says he often started main events at the back of the pack. But the rising cost of racing eventually caused Benner to hang up his helmet. Benner has 12 grandchildren, 20 great grandchildren and “a couple of great great grandchildren.” But you’d never know this retired race driver is in his 90s by chatting with him. Benner’s in good shape physically, perhaps because he loves to golf. And his memory is sharp, too. Like many of us who have been hanging around race tracks, Benner is a little hard of hearing. But he says not all the blame should go to racing. He says his 42 years of driving a truck for a living likely also contributed to that. Copyright 2010 by Phil Roberts, Creative Enterprises. This story appeared as an “On Track” column in Dirt Racer Magazine.